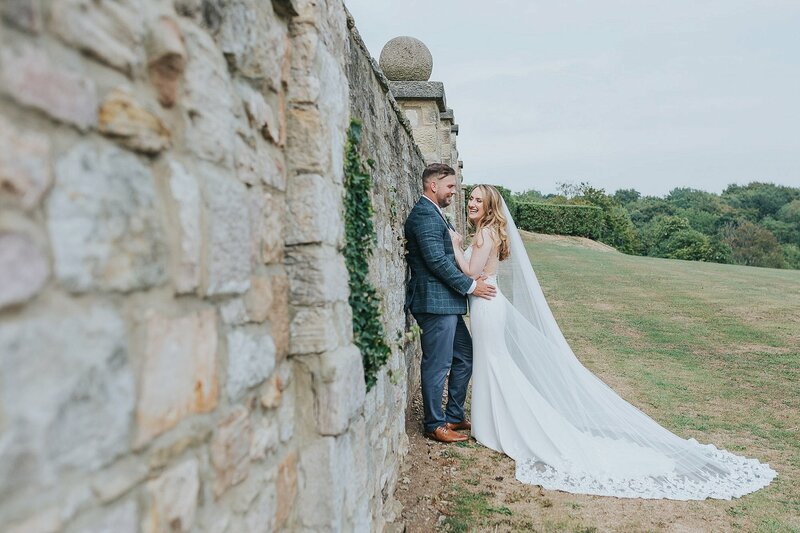 Holly and Stefan got married last summer at the tranquil Wood Hall Hotel & Spa in West Yorkshire. Their July date, which is typically one of the hottest each year, more than delivered for the couple, as they hosted their wedding ceremony outdoors. 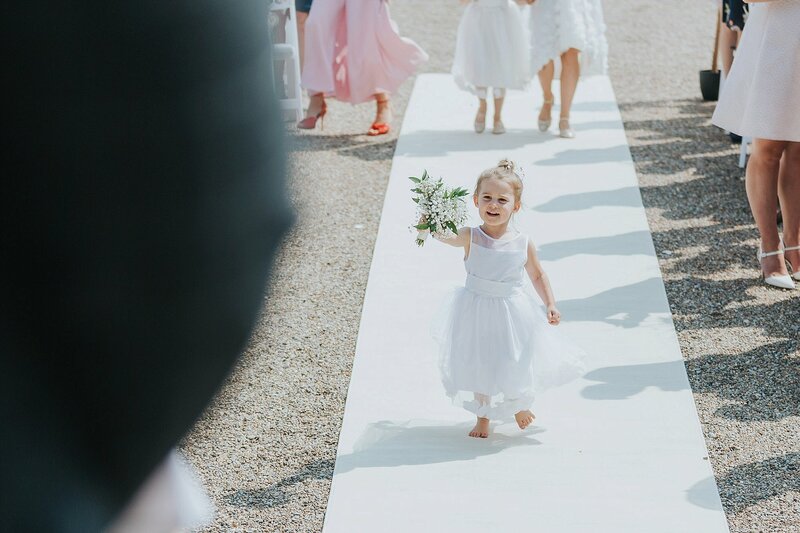 Keeping the theme pared back, the Holly and Stefan opted for a gleaming white palette complemented by green foliage in keeping with the fresh, airy feels of their summertime wedding. Holly says: Stefan took me on a four-day break to the Lake District. He’d booked a log cabin at the Tranquil Otter which overlooked a lake with a rowing boat. On the last night, he cooked me a three-course meal with champagne, with candles everywhere and he had put the scrabble board on the dining table which read ‘I love you, will you marry me?’ with the ring in the ring box. 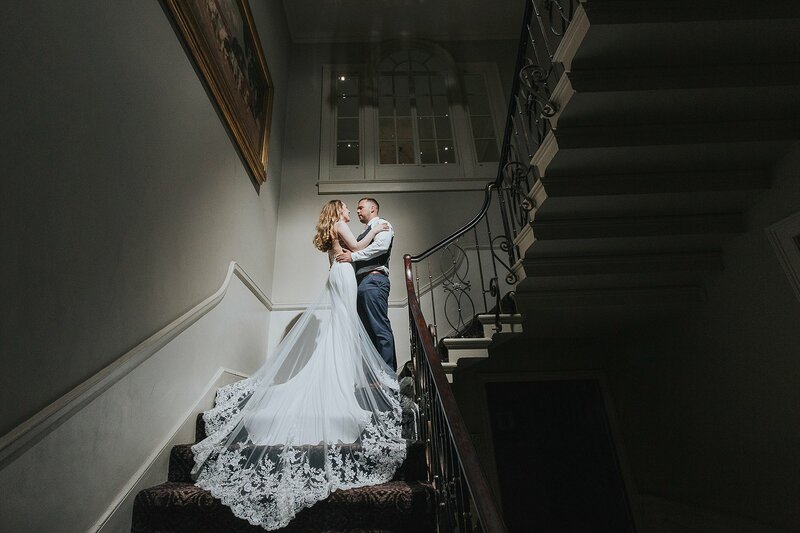 We got married on Friday 27th July 2018, I purposely chose this date as it tends to be the hottest day of the year and I hate the rain. 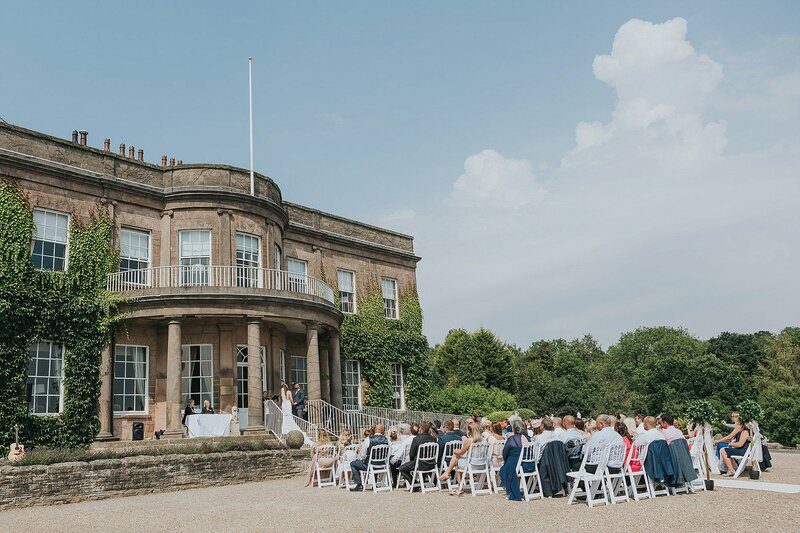 We chose Wood Hall Hotel & Spa in Wetherby, for both our outdoors ceremony and reception. 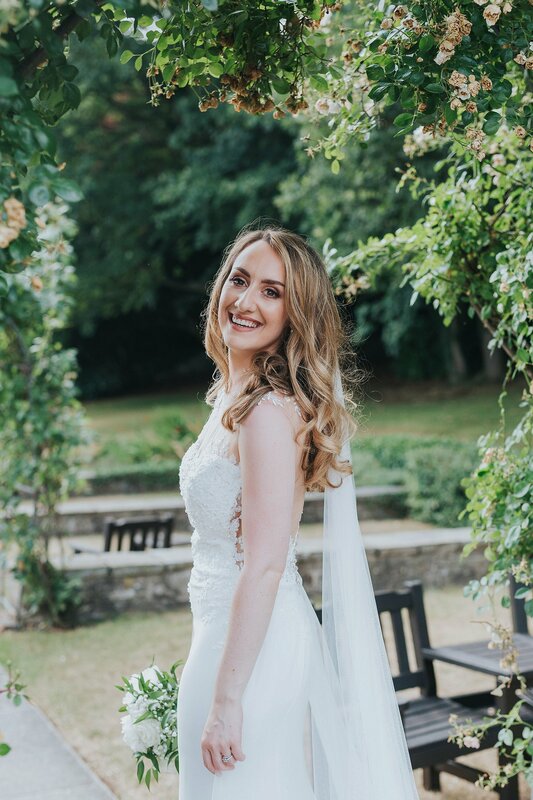 We picked the venue because it’s in such a gorgeous location with the most stunning views, the staff were amazing and I desperately wanted to get married outside in the sun! A huge bonus is that it also has 44 rooms for all your guests to stay over. There was no particular theme for our wedding day. I opted for a clean look with all whites for my flowers, cake and decorations, paired with green foliage to break it up slightly. With it being summer, I wanted to keep it as light and airy as possible. Apart from the white and neutral colours, I chose gold for my bridesmaids and for the table decorations to keep within the theme. I think gold is gorgeous for a summer wedding and it’s not too dark. I chose a Dando London dress purchased from The Little Pearl Bridal Boutique in Pickering. Diana helped me pick my dream dress! I knew I always wanted a very fitted dress, it had gorgeous lace on the front and on the back of the gown, with a button back. It also had a detachable train which came from my waist, which was to die for! I then removed it for the evening reception. 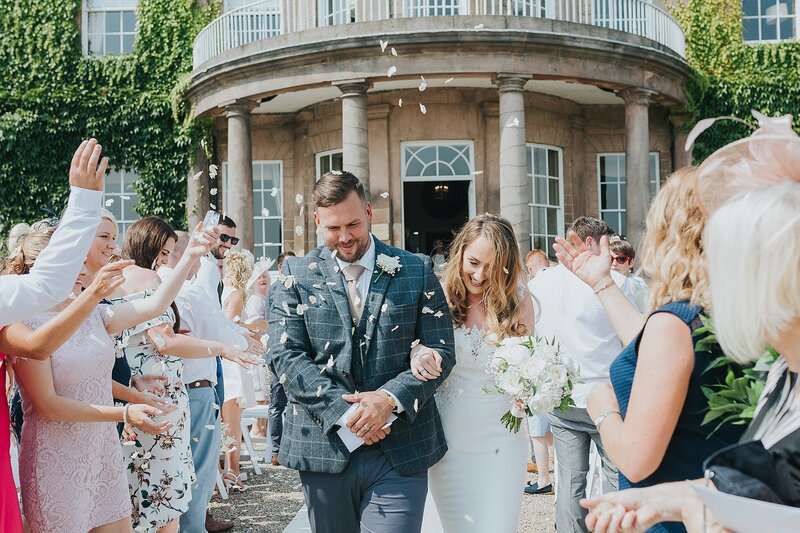 Stefan wore a suit from Moss Bros. We opted for a grey tweed look for the jacket and waistcoat with a knitted gold tie, we also chose a faded blue and grey chino rather than trousers, to tie in with the summer theme, as we didn’t want it to be too formal. The groomsmen all wore the same as Stefan. 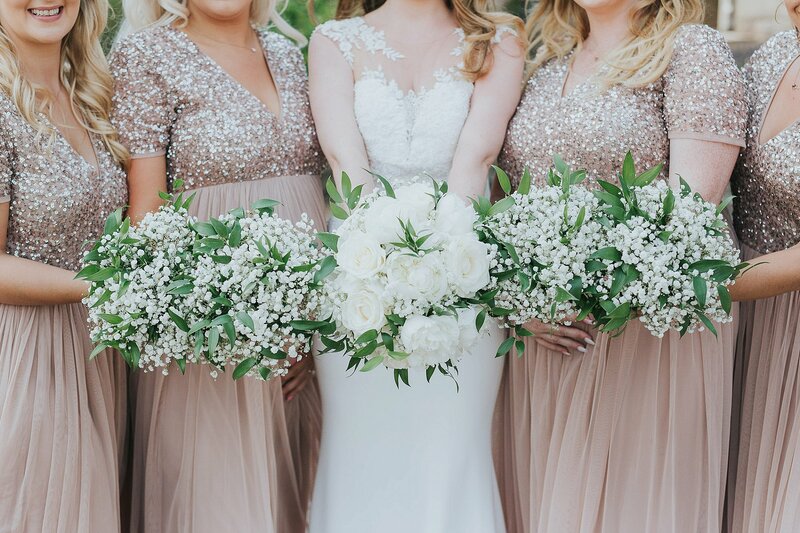 My bridesmaids wore gold sequin and tulle dresses from ASOS and my flower girls wore white dresses from Marks & Spencer. Our makeup artist was Georgia Dixon, who I’ve used previously to do my makeup, and she was incredible. All of the bridal party’s hair was done by my hairdresser, Charlotte MacDonald. The night before the wedding, we stayed at a lodge at Rudding Park and we travelled over to Wood Hall in the morning to continue getting ready. Laura Calderwood was our photographer for the big day, with second shooter Lissa Alexandra Photography. I scoured the internet for weeks to pick our photographer as I was determined to find someone that had the same taste as me. 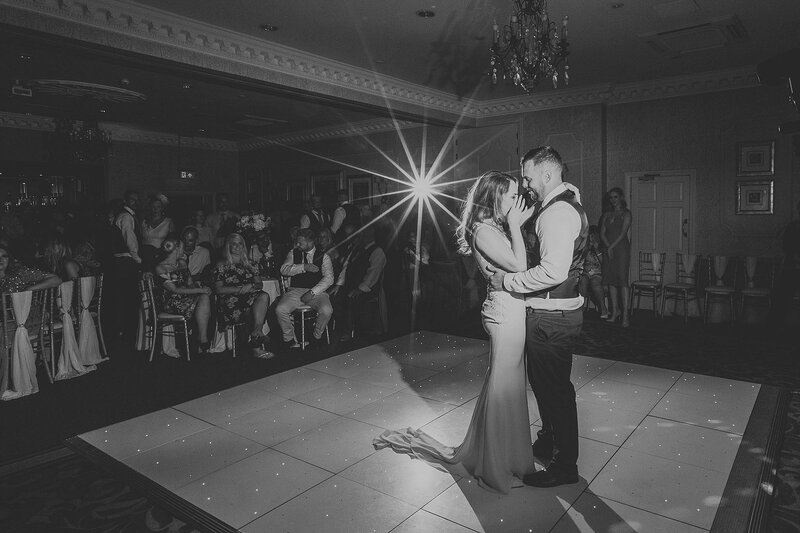 We arranged a meeting with Laura at the venue and I instantly knew she would be perfect for us, she immediately put us at ease and showed us previous weddings that she’d done at the venue and I fell in love! I love Laura’s casual photography, she captures the best moments that you forget about it. We wanted natural photos of us enjoying our big day and that’s what we got. I would recommend Laura to anyone and everyone. My flowers were provided by Natasha Coustol Floral Designs from Leeds, she’s an award-winning wedding florist. I opted for white roses with gypsophila and green foliage. The flowers for my wedding reception were provided by Natasha too, we chose martini vases filled with the same flowers from my bouquet as centrepieces for our tables. There was a garland of the same flowers around our cake table and also the same garlands for the backdrop that sat behind us at the top table. We also used Ambience Venue Styling who I would certainly recommend. We dealt with a lady called Hana who organised everything for us. Ambience provided white chiffon drops with ivory brooches for our camelot chairs, an ivory aisle runner, champagne table runners and draping for the tables, our gold mirrored table plan and wedding post box. Our wedding favours were small bottles of alcohol, tequila rose (pink was the closest thing I could get to my theme) with a gift tag. Poppy Pickering from Ilkley made our cake – it was a three-tier cake with white roses and gold leaves with small pearl like drops and a champagne gold ribbon. The cake was a zesty lemon and also a classic Victoria sponge. We chose white and red wines for the tables, to allow choice for our guests along with a champagne toast towards the end of the meal. The starter was a pressing of ham hock, spiced pear and toasted brioche. The main was chicken supreme, Lyonnaise potato, spinach and chorizo and the dessert consisted of a lemon posset with rhubarb sorbet and vanilla shortbread. Sam Downing, an acoustic singer, played after our ceremony in the gardens at Wood Hall to keep our guests entertained whilst we went off for photographs. On the evening, we had a DJ from Elite Sound who was a recommended supplier of Wood Hall. I would recommend Wood Hall to anyone. The views are stunning especially if you have an outdoor ceremony and there’s plenty of space for all of your guests. The staff were absolutely outstanding on the day – particularly the wedding coordinators and toastmaster – I was so impressed and so was everyone that attended. The venue also makes the most beautiful backdrop for your wedding photographs that you will cherish forever. My favourite part of the day was our outdoor ceremony, it was beaming sunshine and made the whole place look absolutely gorgeous. We went to the Greek island of Kos for our honeymoon. We opted for a week all-inclusive so we could relax after the craziness of organising the wedding! My top tip for other Brides Up North would be – make sure you have a great wedding coordinator in place at your venue of choice. I couldn’t have organised the full day without the help of Rachel Cox from Wood Hall Hotel & Spa, she was fantastic and made sure my day was perfect. The inspiration features and online directory on Brdies Up North both helped me when planning my wedding, too.